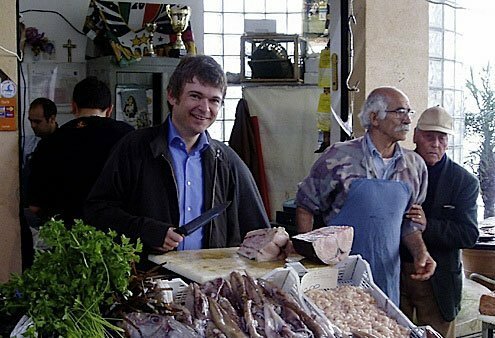 John Dickie at home in an Italian market. When John Dickie’s Genzano landlady took pity on his eating habits, she changed his life. Worn out by the young Scotsman’s halting efforts to make a decent meal, Anna Maria resolved to help him cook. “Cook, that is, in a very basic Italian way,” Dickie says now, “decent pasta, thin spinach omelets, chicory boiled and then turned in oil, garlic and chillies — that kind of thing.” Little did she know that her “saint-like” mentoring would help inspire a book. It’s called “Delizia! The Epic History of the Italians and Their Food” and comes three years after “Cosa Nostra,” Dickie’s acclaimed study of the Italian Mafia praised by The Guardian for its “vibrant, muscular, highly readable style.” In “Delizia,” the 43-year-old Dickie presents an idiosyncratic history of Italian cuisine that traces the development of epicurean traditions from the 12th century to the present. He deftly investigates medieval dining practices in Venice, Ferrara, and Rome, while probing the cultural and culinary influence of Catholicism, the Risorgimento, and Fascism. A senior lecturer in Italian studies at University College, London since 1993, Dickie met landlady Anna Maria during the Thatcher era while conducting doctoral research from the Genzano apartment – the municipality is near Lake Nemi south of Rome. Dickie’s culinary curiosity paralleled his interest in Italian history. Gradually, he came to the “cult” of cooking – which he calls a “joyous conversion.” But Anna Maria’s task wasn’t easy. The book, published by Britain’s Hodder and Stoughton, was released in July and is available in bookstores throughout Italy. Dickie chatted with Corinna Amendola. You vividly discuss elite dining in the 16th-century. What would a nobleman’s meal have been? And who would have been cooking it? Historians don’t have to tax their imaginations when it comes to writing about the dining experience of Renaissance nobility. There is plenty of evidence available. Whole menus for great banquets were recorded, with details of how to prepare each dish. The leading cooks and stewards of the time, men like Cristoforo da Messisbugo and Bartolomeo Scappi, published prestigious volumes on how they went about their job. In my book I use these sources to zoom in on two particularly significant moments: a gargantuan banquet that Messisbugo prepared for the Este family in Ferrara in 1529; and the notorious papal election of 1549 at which Scappi prepared lavish packed lunches for one of the cardinals in the conclave. So it is relatively easy to find out what the wealthy ate in the era of Michelangelo, but it is much harder to empathize with the pleasures they derived from their meals. I strongly suspect that we would find a Renaissance banquets were disgusting: vast quantities of food, containing huge amounts of sugar and spices, with none of the segregation between sweet and savory tastes that we are used to. Some of Messisbugo’s dishes are particularly revolting. One that sticks in the mind (and would probably stick in the throat) is salted pike in a sauce containing pounded almonds, breadcrumbs, rose water, sugar, cinnamon, pine nuts, raisins, saffron, hard-boiled egg yolks and sweet wine. It was served liberally sprinkled with sugar. Pizza is unquestionably Neapolitan, although its origins are unremarkable: it belongs to an extended Mediterranean family of flatbreads, such as the Turkish pide or the foccaccias of other Italian cities. The first sightings of pizzas like the ones we know date back to the early-mid 1800s. 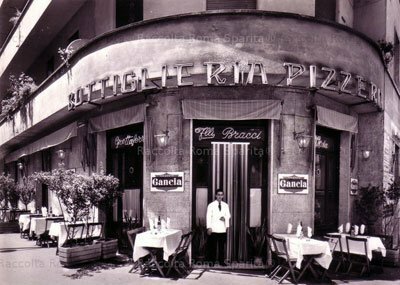 The pizza Margherita has more specific origins: it was named after Queen Margherita of Italy in 1889 when she visited the city to inaugurate the works designed to make Naples more hygienic after the terrible cholera epidemic of a few years earlier. If Queen Margherita did eat pizza in 1889, she was quite a brave woman because it was the cheapest food eaten in the poorest and most insalubrious zones of the city. Several descriptions of pizza from the time refer to how disgusting it was! It took until after the Second World War for pizza to catch on across the country. You write about the ideology of food, particularly over the last half-century. How would a Fascist meal of the 1930s differ from a Communist meal of the 1970s, when that party was ascendant? Can food choices be broken down ideologically, or only by income? I don’t think food choices can be broken down ideologically. Yet many of the political ideologies that have played such an important role in recent Italian history have shared a frugal mindset – I suppose their proponents all liked to pretend they had their minds on higher things than filling their bellies. For example, none of the patriotic writers who contributed to the Risorgimento spent any time trumpeting the virtues of Italian cuisine. Mussolini thought that nobody should spend more than ten minutes a day at table, and his propaganda machine always emphasized how little he ate. Post-war Communist leader Palmiro Togliatti was also a modest eater: he was known to prefer cheap Roman foods like fried salt cod, baccalá. And it was not until Vatican II that the Catholic Church removed the obligation on the faithful to eat fish on Fridays. Amid your impressive and abundant research, did something by surprise? The average Italian was four centimeters taller in 1972 than in 1951. That kind of change can only be attributed to a diet that became much richer in animal protein during the economic miracle. Italians love to talk about the peasant origins of their food. But facts like that remind us just how poorly most Italians ate until very recently – until the peasantry ceased to be a significant sector of the population, in other words. There is a great deal more to the history of Italian food than cucina povera. If there’s such a thing as a north-south food divide, how would you define it? What would the north embrace that the south never would, and vice versa? Traditionally, it was the staples that divided Italy into gastronomic macro-regions. But some of the old distinctions have broken down. Polenta is clearly a northern dish, but consumption plummeted with the arrival of prosperity in the postwar period, and now it is not eaten nearly as much as it used to be when people had no choice. Mussolini tried to introduce another northern staple, risotto, into the south by giving away lots of rice; he thought it would help make Italy less dependent on food imports, but it didn’t work. Dried pasta has had much more success in spreading into the Po valley from its original heartlands. But then dried pasta was never only a southern favorite: its home turf is a long arc of coastline round from Palermo, through Naples and Rome, and up into Genoa. The Mediterranean diet is idealized, but in Italy obesity is on the rise. So is fast food. Do you sense Italian cuisine changing to accommodate “healthy eating” concerns? Very much so. The man behind the “Mediterranean diet” – he was the one who coined the phrase – was an American scientist, Ancel Keys. He first proved the link between fat consumption, cholesterol, and coronary heart disease. His research began in Italy in the 1950s by comparing the food and health of Neapolitan firemen, Bolognese policemen, and white-collar workers from his home city of Minneapolis. What he found was that the firemen were living to a ripe old age, while the American businessmen were dying at epidemic rates from heart attacks and strokes, and the Bolognesi were somewhere in-between. Italians in the north took a while to absorb the Keys message, but they did eventually. Since the 1980s, as a direct result, olive oil has conquered the whole of the country, including the Po valley where lard or butter were the traditional cooking fats. The great thing about Italian food is that it is so varied that there is always some regional specialty that fits whatever the latest health fad happens to be. How would you imagine a meal in future Italy? What do you sense on the horizon? Alas, there’s nothing in my research that would help me see into the future. I’d say three things are going to shape the way Italians eat in the years to come. First, the fact that Italy has become a multi-ethnic country. Italy still has far fewer ethnic restaurants than other European states, but how long will that last? Second, the rise of ethical eating. Just how much influence the Slow Food movement will have is very difficult to tell. And third, the relentless progress of consumer capitalism. Italian families, with their spoiled only children, will struggle to maintain their eating traditions in the face of pre-prepared meals and the like. If you had a week in Italy, where would you go, gastronomically speaking? I’d really love to spend a week eating and drinking my way around Piedmont, particularly the Langhe. And your most memorable Italian restaurant meal? Corinna Amendola occasionally writes the "lost in Translation" column. Originally from Delaware, she lives with her husband in Geneva.